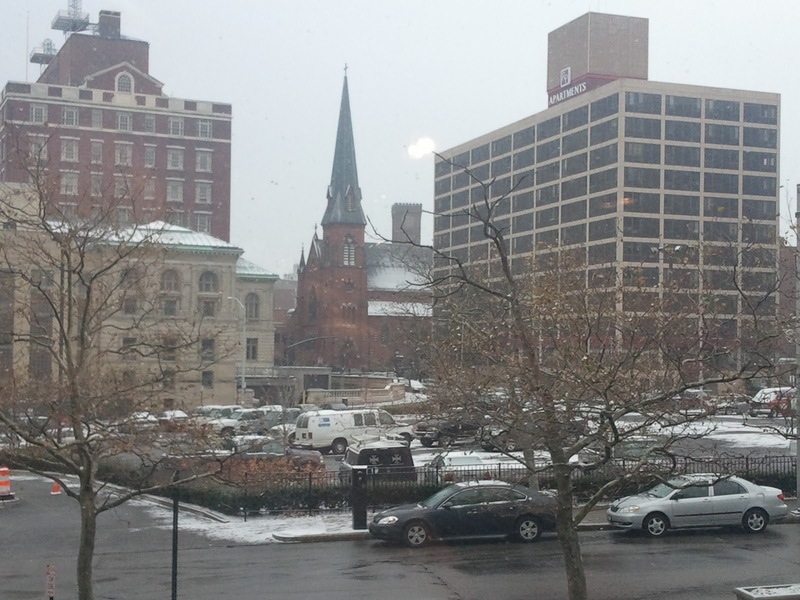 Woke up this morning, the first day of December, to a "dusting" of snow in Providence - a cold kick in the gut to tell me that college basketball season is upon us. It was a nice reminiscence to see four Dunkin' Donuts establishments between the gate at the airport and the hotel. 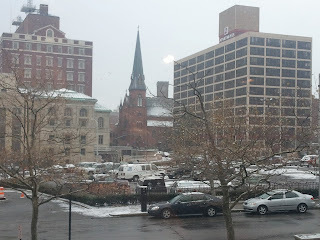 In fact the hotel was about 100 feet from the Dunkin' Donuts Center, the site of the PC/Mississippi State hoops game, making it the easiest work commute of this or any other year. I haven't been in The Ocean State in close to 10 years. I had a number of good times back in the day on Providence College hoops games, and of course the most miserable professional experience of my life, in production of the first X-Games in the summer of 1995. I swore I'd never do the event again until they asked again, and in 1998 I spent 3 more miserable weeks on the event before swearing it off for good. They managed to ruin both Newport RI and San Diego CA trips. In an ironic twist, my former roommate, who is more of a baseball nut than I am, is now in charge of something called X-Games Global. Godspeed. Despite all of the upheaval in college conference positioning, The Big East offices of course remain in Providence, where Dave Gavitt organized seven northeast basketball schools in 1979. In an ironic twist, that was the same year ESPN was launched. Nobody possibly could have envisioned the type of growth that would take place on either front, and a lot would go hand-in-hand. Though now, the Big East is fighting for survival and/or relevance. And one would have to wonder if the Providence headquarters is the right fit for the future of the new Big East. But then again, the basketball schools that forged the Big East still remain: Georgetown, St. John's, UConn, Providence, Seton Hall and Villanova. So maybe they can survive on that level, even with football driving the bus. The Big East did well to hire network programming honcho Mike Aresco as Commissioner, but it may be too little too late. The Big East may find themselves in the same boat as the Republican Party, re-brand to survive. And that would likely mean a move to New York or Philadelphia or even Cincinnati, and the end of an era.